Stop telling Notorious R.B.G. to step away from the bench. The one & only Notorious R.B.G. This Sunday morning, I snapped open my copy of the Los Angeles Times to see yet another “everyone says [U.S. Supreme Court Associate Justice] Ruth Bader Ginsburg should retire ZOMG now now NOW!!! !” story. (The online version of the story’s headline today says “she has no plans to retire soon,” but the headline of the paper edition gave voice to her critics who are trying to shoo her off the bench.) 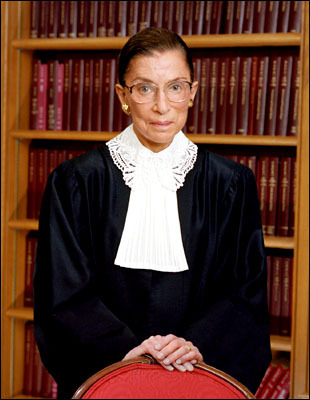 If she retired today or in December, do any of these so-called liberals or leftists seriously think President Obama would get any judge remotely similar to her through the U.S. Senate’s “advise and consent” process? Who do you think President Obama could appoint at this very day, given the boundaries that we have? If I resign any time this year, he could not successfully appoint anyone I would like to see in the court. [The Senate Democrats] took off the filibuster for lower federal court appointments, but it remains for this court. So anybody who thinks that if I step down, Obama could appoint someone like me, they’re misguided. As long as I can do the job full steam…. I think I’ll recognize when the time comes that I can’t any longer. But now I can. The calls for her to go are just damned disrespectful, and put me in mind of the frantic, shrill screams of Obamatrons for Hillary Clinton to drop out of the Democratic primary now now NOW!!!!! in April and May of 2008, because staying on ballot through the primary season was somehow going to cause irreparable damage to the Obama 2008 campaign. You remember that general campaign, don’t you? The one in which it would have been possible for Barack Obama in fact to be a Kenyan anti-colonial Muslim socialist and still win the election because he wasn’t the Republican? Yeah, Hillary Clinton’s demonic powers were imagined to be so great that she’d blow the general for Obama, but somehow they weren’t powerful enough for her to win the Dem primary. Go figure. Isn’t it funny, and by funny I really mean infuriating, how eager so-called liberals are to toss aside the women who have worked on their causes for decades, and even lifetimes? Think of what the right wing and the left wing together have done to the reputations of Margaret Sanger or Mary Daly. Somehow Americans still have room for Abraham Lincoln, Franklin Roosevelt, and Martin Luther King in the American Pantheon, although they recognize that their views on race and gender were of their time rather than our times. It’s only women activists whose every utterance and political position is held up to scrutiny, mostly for the purposes of undermining their entire lifetime’s work. R.B.G. is swinging for the fences at age 81. She’s got her eye on history. She’s pretty sure her side is going to win, if not in her lifetime, eventually. Let her lay out her case so that succeeding generations can appreciate her dogged, persistent resistance to the revanchist Rehnquist and Roberts courts. “R.B.G. is swinging for the fences at age 81. She’s got her eye on history. She’s pretty sure her side is going to win, if not in her lifetime, eventually. Let her lay out her case so that succeeding generations can appreciate her dogged, persistent resistance to the revanchist Rehnquist and Roberts courts.” – Amen! Hmm, I always want to tell certain other justices to step away from the bench, but she seems so smart and knowledgeble that I want her THERE! No kidding. We live in a 24×7 festival of laughs. Notorious R.B.G. is the best. She’s smart, funny, snarky, has done important work to bend the US legal system toward equity and justice, and can do more push-ups than I can do. It helps that she only weighs something like 85 pounds, soaking wet. but yes: she’s a gym rat, too. Yeah, this shitte is bulleshitte. We’re almost certainly going to elect another Dem prez in 2016, so what’s the fucken rush? The rush is to get women off the stage as soon as possible. Maybe there were murmurs to get Thurgood Marshall off the bench, but I don’t remember it. Because he aged and died amidst a Republican run in the White House, I think most people who cared about Civil Rights were interested in letting him serve as long as possible & hoped that he’d outlive Bush I. The women’s movement is the only social justice movement of the past 240+ years that is always in a hurry to get rid of their elders so that we can kick dirt on their graves. The 1910s and 20s feminists did it to the 19th C feminists; the 1960s-70s feminists did it to the 1920s feminists; my generation is doing it to the 1960s-70s generation, and now my generation is on the verge of it being done to us. That’s how we roll. Like most leftist movements we eat our own, but we just can’t get over how fat, unfashionable, boring, offensive, and embarrassing our foremothers were, and are, and will always be. What’s really embarrassing is how ignorant we are of our own history, and how we don’t get it that attacking our elders really undermines the movement. Does the Civil Rights movement feel they have to apologize for MLK’s plagiarism and serial adultery? No. But we feminists fall for that crap every time. Even if they could get somebody with the requisite predictable voting record confirmed, the quality of the necessary dissents would fall off, and the opinion-writing for the record and the guidance of other courts in the Federal Reports would decay. Questions from the bench that should be asked would not be asked, nor would their absence be noted. W.O. Douglas stayed around pretty late, as I recall. She should just remand this amicus advice to its originators. We know that she sees Sandra Day O’Connor’s resignation as a cautionary tale. By the time she resigned to care for her husband, her husband was so far gone with dementia that he forgot who she was & had fallen in love with another woman. She’s still going strong now 9 years later–how much better for us all had she stuck it out and decided not to care about having a Republican appoint her successor. Well, now, with news of a looming Attorney General confirmation battle, I think that pretty much seals the question of how much appetite there would be at 1600 PA for a contemporaneous fight over a Supreme Court nominee. It would be perceived as a perfect time to cap and trade, in what direction we could well imagine. Far better to trust that scenario to HRC 2.5 + years from now. Did anyone see Rachel Maddow’s hilarious review of Holder’s tenure as top cop? Good Luck with the Asparagus! I, too, was thinking of Sandra Day O’Connor, who, as far as I can tell, is still fully qualified for the bench at 84 (though she’s also found worthwhile things to do instead). This doesn’t entirely apply to RBG, who by her own account had a husband who took her career as seriously as his own, but shouldn’t women’s careers actually last a bit longer, since they (we) on average live longer, and many of us spend at least some of our prime years with more energy given to caregiving than is the case for your average male? This would also apply, of course, to a certain former secretary of state who recently became a grandmother, whose career choices were sharply limited for at least 8 years (and probably far more) by her husband’s career choices. More evidence of the awesomeness of R.B.G.